Ethiopian Airlines has offered the grieving families of 157 victims of last Sunday's Boeing 737 Max plane crash sacks of earth to bury in place of their loved ones. According to AP, officials have begun delivering bags of earth to family members of the victims of the crash instead of the remains of their loved ones because the identification process is going to take such a long time. Families have been told the identification of the remains could take up to six months because the body parts are in small pieces following the tragic crash that took the lives of 149 passengers and 8 crew members. A mass memorial service for the victims is planned to take place today in Addis Ababa one week after the crash. 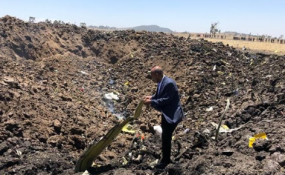 On Friday, France's air safety agency began studying data from the black boxes of a Boeing 737 MAX plane that crashed in Ethiopia minutes after takeoff from Addis. France's Bureau of Enquiry and Analysis for Civil Aviation Safety (BEA) received the flight data and cockpit voice recorders on Thursday after retrieval from the crash site. This is the second crash involving a 737 MAX plane since October when a Lion Air passenger plane plunged into the sea killing 189 people on board.